New Delhi: For the people of Bundelkhand, Madhya Pradesh, access to development schemes often has been hindered by a lack of awareness about what is available, a common problem in rural India. One of the hurdles, according to Anujaa Shukla of the Society for Development Alternatives, a non-governmental organization that has worked in the region for 28 years, is that there has been “virtually no communication platform from which rural people can conduct a dialogue and get information or voice their issues and look for solutions." Listen to Podcast | A traditional song on Queen of Jhansi by Ramadhin Arya a local singer, lyricist and composer for Radio Bundelkhand. 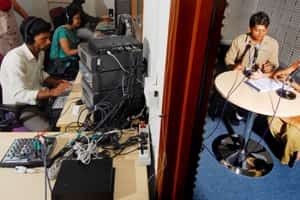 In response, the society launched Radio Bundelkhand in 2008, a community radio station to broadcast into the vacuum created by poverty and inadequate education, breaking the silence on topics such as women’s rights, health and hygiene and entitlement programmes for the poor. Information on the Union government’s rural jobs scheme was disseminated and a poll special examined the candidates for a local election. In the summer of 2009, a water campaign resulted in the successful repair of a local well within days. Listen to Podcast | A song on MGNREGA scheme by Kalicharan a local singer, lyricist and composer for Radio Bundelkhand. “The idea was that we wanted to inform the community on their rights and to disseminate information regarding development and related good practices on education and empowerment to preserve the local culture of the area," said Shukla, the society’s programme manager, communications, Bundelkhand. Radio Bundelkhand reaches 131 villages in the districts of Jhansi and Tikamgarh of Uttar Pradesh and Madhya Pradesh. As a large percentage of the people is illiterate and most know little or no English and Hindi, the medium of communication is their local Bundeli language. Development workers often talk about the need to empower and educate the communities they serve before the work of implementation begins. In a region where access to information about rights, opportunities and public schemes can be the difference between an ailing community and a thriving one, the benefits of community radio are obvious. “The mainstream media is only based on high-level politics and issues of the capitalistic man," said Shukla. “In commercial radio there is no place for the common man. The presentation is very dull and boring; there is no participation. Radio Bundelkhand is participatory and democratic—it’s the fourth pillar of the community." Although initiated by the society, the programmes are conceived, written and produced by the communities themselves. Young local reporters put together schedules comprising interviews with members of the community, reports on agriculture, women’s issues and local events, radio dramas and folk songs by Bundeli singers—they have a database of at least 1,100 folk songs. Through a combination of information, training and entertainment, the radio station wants to empower villagers with a far larger reach than they could otherwise have achieved. To date, the radio station has trained 60 reporters, including nine women. They do various jobs from reporting, editing, anchoring and creating jingles, to packaging and broadcasting the programmes. Prachi Ojha, from the village of Sitapur, Tikamgarh, is an anchor for Radio Bundelkhand. She was the first girl to join the station, when she was in class 10. Shukla says Ojha has inspired other local girls to join. A surprising result of the initiative is the extent to which it has affected and been affected by the women of the community, according to Shukla. “It was really a big challenge for us," she says. “It’s a patriarchal and a male chauvinist society; even now women are sometimes not ready to speak on microphone." Using storytelling and dramas based around domestic issues, the radio station began to change this perception. It encourages listener interaction and participation and Shukla says it now gets a great deal of feedback from local women. The radio has not yet been successful in interesting local advertisers. But with the help of several grants, the initiative has expanded from four-hour broadcasts to nine hours and initiated broadcasts from smart phones and phone-in programmes.